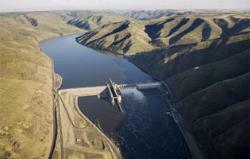 View an audio and photo slideshow of the Snake River Dams. LEWISTON, Idaho -- From Don Bott's second-floor window in downtown Lewiston, it's hard to believe this city is a seaport. Bott's window offers a view of the treeless slope of Lewiston Hill rising 2,000 feet toward a powder-blue sky -- but no glimpse of the water that runs 465 miles to the Pacific Ocean. The Snake and Clearwater rivers, which meet at the heart of the city, are hidden behind miles of levees built and maintained by the Army Corps of Engineers to protect Lewiston from water backed up by Lower Granite Dam. The slack water is a boon to farmers, who use it to float their grain on barges all the way downstream to Vancouver and Portland. Yet the river is exacting its revenge. Each year, a massive amount of silt falls out where the free-flowing river slows to a crawl. In the three decades since Lower Granite Dam created a 39-mile-long reservoir stretching to Lewiston, the gap between the highest foreseeable flood and the top of the levee has dwindled from 5 to 1½ feet as sediment piles up on the bottom. Possible solutions -- raising the levees, dredging, or flushing the reservoir -- each create new problems that the city, shippers or the corps find unacceptable. Environmental groups are latching on to the conundrum. They have long pushed to breach four federal dams to restore the Snake's legendary wild salmon runs, a point bolstered last week by a federal appellate court ruling. 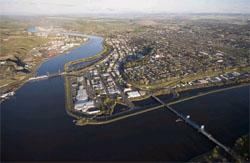 Now, they see the buildup of sediment as a practical reason to restore 140 miles of free-flowing river between Lewiston and the Snake's confluence with the Columbia at Pasco. Seven environmental groups, led by the National Wildlife Federation, sued the corps to force officials to come up with a long-term plan for dealing with sediment piling up in the river bottom. The situation reverberates across the Columbia River basin, both in terms of the Snake's ecological value as home to the basin's largest historic salmon runs and for its economic value as a river highway that also happens to generate 5 percent of the region's energy load. Bott, an architect who moved to Lewiston the same year the corps finished Lower Granite in 1975, sees no easy solution. "I'm not for the dams or against the dams necessarily," he said. "I'd say eventually the dams are going to come out. I think the handwriting's on the wall." In Lewiston, the reservoir is rising as sediment pours in from a drainage basin encompassing 32,000 square miles of forests, farms and towns. If water overtops the levees, the consequences would be dire. "Basically, the core of downtown would all be flooded," said Chris Davies, the city's public works director. Yet the city doesn't want the corps to raise the levees, which have become a recreational magnet for the community. Joggers, anglers and parents with babies in strollers congregate atop the levees and in their associated parks. Raising the levees 3 feet, as the corps has suggested in the past, also would require a complicated and expensive project to raise three bridges. It would further cut off the city of 30,000 from its rivers. Even as the city defends the levees as they are, it also insists any solution to the sediment problem must maintain a navigable waterway to the Pacific, positions that City Manager Jay Krauss acknowledged as contradictory. Simply scooping the sediment out of the river would be a monumental task. Carl Christianson, the corps' project manager for the sedimentation study, said most of the grit flowing down the Snake and Clearwater accumulates in the upper 10 miles of the reservoir near Lewiston and Clarkston -- roughly 1 million cubic yards every year. Imagine enough muck to coat a square mile a foot deep, and you have an idea of the average yearly accumulation in this area. The corps has struggled to dredge a fraction of that amount -- 300,000 to 500,000 cubic yards roughly every five years -- just to maintain the relatively narrow 14-foot-deep navigation channel. One way the corps proposes to deal with the silt is by cutting it off at the source. The agency is reaching out to farm groups, cities and federal land managers in five watersheds draining parts of central Idaho, Eastern Washington and northeast Oregon in an attempt to reduce sediment sloughing into creeks. Conservationists say this is a laudable goal, but they're skeptical it will do much to help. "I would hope the corps isn't going to spend a lot of time on red herrings like reducing sedimentation in the basin," said Bert Bowler, a retired Idaho Department of Fish and Game biologist. Bowler, who serves as staff scientist for Idaho Rivers United, one of the environmental groups that sued the corps over the sediment issue, is equally skeptical about other ideas to reduce the flood hazard in Lewiston. These ideas include underwater dikes that would steer sediment toward the middle of the river, where faster flows could sweep it downstream; a "bubble curtain" of jetted air to push sand and silt downstream; or periodically drawing down Lower Granite to flush sediment out. This last idea worries John Piggott, general manager of Vancouver-based Tidewater Barge Lines, which operates a fleet of deep-draft barges along the river. He compared drawing down the river to taking a section out of Interstate 5. Plus, a draw-down could be damaging. In March of 1992, when the corps conducted an experimental draw-down, large chunks of material undergirding roadbeds and marinas fell away. Lewiston's levees also sustained damage during the 1992 drawdown, underscoring the fact that the corps can't just empty Lower Granite like a bathtub in anticipation of a flood. The integrity of the levees relies on the hydrostatic weight of the reservoir behind them. "You take that pressure away, and you can start to have erosion and develop pockets of weakness, potentially," Christianson said. Each of the various solutions displeases someone. Into the breach, environmentalists lobbed the most sweeping and controversial suggestion of all: Take out the dams altogether. Port of Lewiston Manager Dave Doeringsfeld dismisses such talk as nonsense. He said the four dams are now part of the social and economic fabric of the Northwest, producing enough hydroelectricity to energize a city the size of Seattle while providing a needed navigation corridor. Rail service has dwindled since the days before Lower Granite brought a reservoir to Lewiston in 1975, Doeringsfeld said, and there is no way railroads could handle the material that's barged today. The cost of shipping grain would rise without the dams. The loss of Lewiston as a seaport would add 5 to 30 cents to a bushel of wheat now being shipped on the Snake River, according to an analysis eight years ago by a panel of economic advisers to the Northwest Power and Conservation Council. A typical 2,000-acre wheat farm might produce 200,000 bushels per year. "If in fact they're hit by a dime (increase), their bottom line has been decreased by $20,000," said Ken Casavant, a Washington State University economist who previously served as one of two Washington representatives on the four-state power planning council. "Pennies do matter." Pennies certainly matter to Randy Aruzen, a third-generation farmer who hauls wheat, barley and peas to Lewiston from his farm 52 miles away in Ferdinand, Idaho. He relies on barges to get wheat inexpensively down the Snake and Columbia rivers to international terminals in Vancouver, Portland and Kalama. With this year's Australian wheat crop afflicted by drought, Asian customers are ramping up demand for wheat shipped out of the Pacific Northwest. Aruzen figured the time was right to haul the wheat harvested in August out of his own storage bins and sell it. "People think we're getting rich now on $6 wheat," he said. "But everything else went up with it." Out of the $5.97 Aruzen gets for each bushel of wheat, he must pay for fertilizers and herbicides to coax the crop out of the ground. He needs to pay for fuel to operate his tractors to get the grain to Lewiston, and he must account for general wear and tear on his equipment. "It's a gamble," he said. "This is worse than Las Vegas." To improve the odds, he invested in his own truck to haul grain to the Lewis and Clark Terminal on the north bank of the Clearwater in Lewiston. Six cylindrical grain elevators rise above the river, each roughly the size and shape of the Smith Tower in downtown Vancouver and big enough to hold 250,000 bushels of wheat. In a year's time, the terminal ships between 16 million and 18 million bushels of grain, General Manager Arvid Lyons said. Farmers see elevators such as these as an economic lifeline. Aruzen can't control the rainfall that feeds his crops or the global market that affects the price, but he does have a say in keeping a cost-effective navigation channel. And, like many dryland farmers across the Inland Northwest, Aruzen bristles at any suggestion that Lewiston may not have a long-term future as a seaport. Others see the inexorable buildup of sediment as an opportunity for the community to shift focus. Dustin Aherin, a 33-year-old fourth-generation resident who operates a summer rafting business, said cracks are beginning to form in the area's past unswerving dedication to the dams. A free-flowing river, along with investments in better highways and rail, would lure new kinds of businesses to the Lewis and Clark Valley, he said. The lack of job opportunities means few of his high school classmates return after leaving Lewiston for college. "We're sitting in prime real estate if those levees weren't there," Aherin said. "More people are questioning why we've put all our eggs in one basket." Lyons, who has managed the Lewis and Clark grain terminal for the past 20 years, is frustrated over the polarizing debate over dam-breaching. A Portland-area native who says he periodically visits the ocean just to breathe the fresh salt air, Lyons credits the "bulldog tenacity" of environmental groups for forcing the corps to modify the dams to pass fish more safely. Although each dam kills anywhere from 2 percent to 10 percent of the ocean-bound smolts, the government has invested heavily to install huge spillway weirs and bypass screens to reduce mortality. Lyons is skeptical about claims that Lewiston will transform itself into a haven for rich retirees and high-tech entrepreneurs if the dams go away. "To think that tourism is going to help this community, I think that's misguided," he said. Meanwhile, sediment continues to pour into the reservoir. Bott, the architect who owns four buildings downtown, said he's talked with plenty of area residents who privately doubt Lewiston's future as a seaport. He said he is a rare businessman willing to voice that skepticism publicly. When the Clinton administration considered dam-breaching seven years ago, "Save Our Dams" placards and bumper stickers papered the landscape. To this day, few Northwest politicians -- Democrat or Republican -- are willing to question the value of keeping the dams in place. Yet, Bott knows there is a value hidden beyond the levees and beneath the reservoir's glassy-smooth surface. "There's a river running under there," he said. The Bush administration has committed $600 million a year in an "aggressive nonbreach" approach to conserving endangered salmon in the Columbia River basin. The Columbia River handles almost 40 percent of all U.S. wheat exports, and is the third largest grain corridor on the planet, according to the Port of Portland. Four of the 13 listed stocks of Columbia basin salmon protected by the Endangered Species Act reside in the Snake River: sockeye; spring and summer chinook; fall chinook; and steelhead. The United Harvest terminal at the Port of Vancouver exported 1.8 metric tons of wheat in 2006, with barges delivering about half of that. The Snake River produced upwards of 40 percent of all chinook returning to the Columbia River basin before Euro-American settlement, according to estimates based on available habitat published by the Northwest Power Planning Council. To and from the Port of Lewiston, the Snake River carries 12 million tons a year of wheat, peas, lentils, wood products and talc from Idaho, Montana, Oregon, Washington and Canada. Oct. 9, 2005: Lewis and Clark rode a wild Snake River; today it is an avenue of commerce. Oct. 12, 2005: Salmon meeting turns into forum on dams. May 27, 2005: Judge rejects salmon opinion. Oct. 7, 2006: Pressure Builds on Snake River Dams, says ex-Secretary Babbitt. View an audio and photo slideshow of the Snake River Dam.